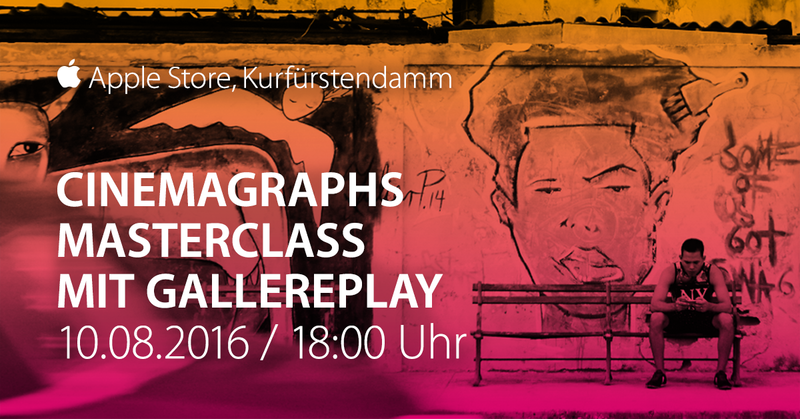 Exciting news: Apple has invited gallereplay to host a Cinemagraph Masterclass at the Apple Store in Berlin on August 10th. Get your free tickets now, while they last! This coming Wednesday, August 10th, gallereplay co-founders Lydia Dietsch and Marco Woldt will host a free cinemagraph workshop at Berlin’s illustrious Apple Store. In a one hour session, the duo will give an introduction to the cinemagraph medium, share their founders’ story, and provide practical tips on how to shoot and edit cinemagraphs. You can sign up for the event now via the Apple Events page (HERE). Be quick – space is limited. The Masterclass kicks off at 18:00 and will be followed by a Q&A. Hope to see you all at Kurfürstendamm next Wednesday!